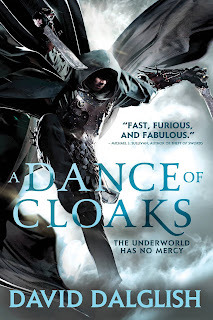 I hadn't heard of Dalglish's Shadowdance series before I picked up the first in the series, but at the time I had a hankering for fantasy, and A Dance of Cloaks sounded like it would contain all I could want with regards to fantasy thieves and assassins. 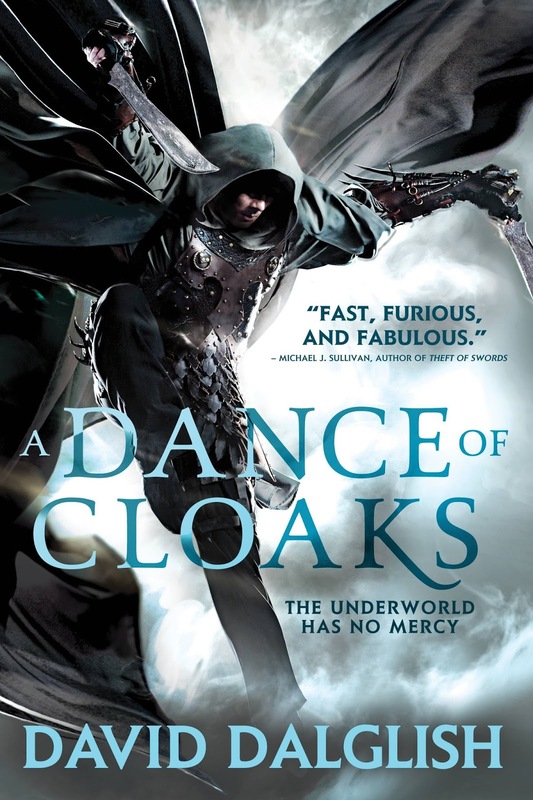 A Dance of Cloaks is set in the city of Veldaren at the peak of a war between the city's thieves' guilds and a group of high-ranking merchants known as the Trifect. After five years of constant conflict, both sides are more than ready for the conflict to finish, but neither are they willing to let the other side win. Thren Felhorn, the de facto leader of the guilds and the man responsible for starting the war in the first place, is now moving his forces to destroy the Trifect once and for all. But there are other plots hatching at the same time, and the reaction of them all colliding may make ending the war a lot deadlier. For some reason the blurb wants the reader to think that the main character is Aaron, Thren's son. While his personal storyline does make up a fair chunk of the narrative, it does oversimplify things somewhat. So instead of my usual tactic of looking at plot and character separately, here's a basic run-down of the main threads followed in A Dance of Cloaks' narrative, with some commentary. Firstly, there is the aforementioned character arc for Aaron. As Thren's son and heir, he has a lot to live up to, and his father is determined that Aaron be the most feared and respected assassin in Veldaren, even more than Thren currently is. But the means that Thren uses, disallowing any kind of human contact that isn't furthering his education as a killer, leaves Aaron unfulfilled, leading to his adopting an alternate identity by the name of Haern. This arc was quite nicely fleshed-out, with Aaron's desire to diverge from Thren's brutal and merciless means of ruling emerging gradually and organically. The prologue at the beginning does jar a little, as it seems a bit off that as an eight-year-old he has no problem with the assassin's life, but as a thirteen-year-old he has suddenly grown a conscience of sorts. It's not a huge problem though, and I would be more than happy to continue the series to see how his development continues. Secondly, there is the character arc for Alyssa Gemcroft, the daughter and heir to one of the Trifect houses. After being convinced by her lover that she would be a far better head of the household than her father, she finds herself caught up in a failed coup and running for her life. Confined to the camp of her lover and his father, she soon realises that they only want to get ahold of her family fortune and so she schemes with the faceless assassin priestesses of Karak to get back into her father's good graces. While I do love the political intrigue with this arc, I did have a couple of issues with the whole Karak part of it. First, and I can't believe I'm about to say this, but there's too much backstabbing within this priesthood for it to be wholly believable. A single bungled mission leads to two separate deals being made with the same person/people with the same land in the balance but slightly different aims, the priesthood having no less than three contracts on at once with both sides in the thieves/Trifect conflict, and at one point a big old purge of the priesthood is added to the mix. It's something of a mess to keep track of at times. Second, the priestesses are a bit of a mixed bag. On the one hand, they're powerful magic assassins and are utterly awesome. On the other hand, there doesn't seem to have been much of an effort to characterise them enough to tell them apart. The fact that they're covered head to toe in cloaks makes this even harder, because you can't even fall back on the tried and trusted "distinguish by physical appearance" method. Not as tightly written as Aaron's arc, but not bad either. Thirdly, is the character arc for Veliana. As the second-in-command of the Ash Guild, a minor thieves' guild that is unsure of the viability of Thren's plan to attack with Trifect. As the pressure from Thren and his Spider Guild grows, however, she finds it increasingly difficult to keep the people that she loves safe. This was somewhat shorter than the previous arcs, but is all the more intense for it. It's an interesting look at the divisions within the thieves' guilds. It is the source of quite a few scenes of misogynistic violence, so if you have a particular issue with scenes of that nature, then you might want to keep that in mind if considering reading this book. Otherwise, her arc is told quite competently, if not with quite the same emotional engagement as the previously mentioned arcs. Finally, there are a selection of minor arcs that cover how all the various schemes are started up, involving groups like the churches of Karak and Ashhur, and the monarchy. The sections involving the king are especially memorable, even if it does go for the classic "incompetent king and scheming advisor" trope. It is entertaining to see just how vacuous the king, especially when it comes to his opinion of his own effectiveness as a ruler. I'm hoping that the monarchy gets a bigger part in subsequent parts, if only to see how much worse this king can get.